How do things work? To find out, we observe them and we take them apart. But not everything is easily observed, and until recently some things couldn’t be taken apart. Imagine you have a toy car. You can inquire into its physics on several levels. If you want to know why it weighs what it weighs, or why one material bends and another is rigid, you have to look closer — closer, in fact, than your eyes are capable of. That’s why we invented microscopes and tests for things like how something is made up chemically. Particle accelerators were thought up quite a long time ago — going on a century now — and are in some ways remarkably simple. 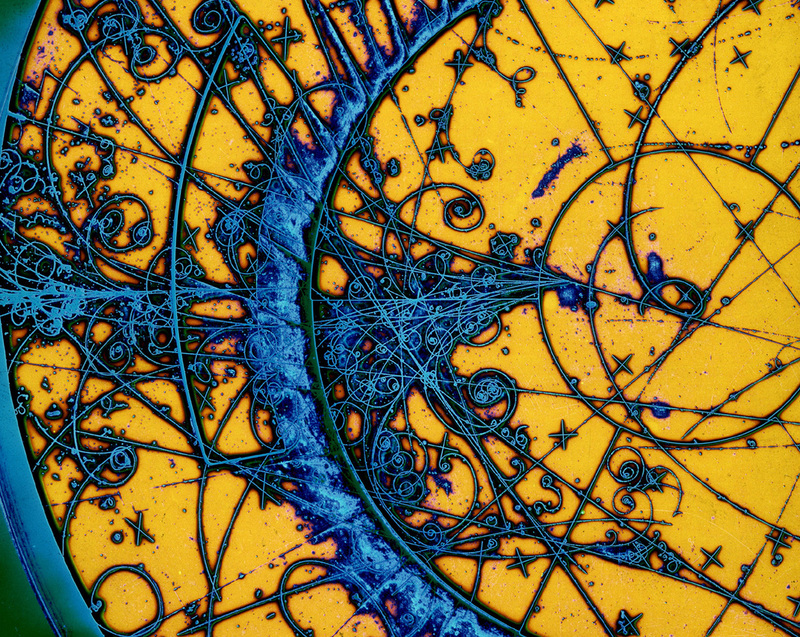 Bubble chambers were early particle detectors into which particles of different energies would penetrate with different depths and patterns. Look closely at the point of impact, and you see the traces of particles very small indeed. Protons and other subatomic particles, exposed momentarily to forces and temperatures on the order of the Big Bang’s, explode into a menagerie of exotic components: positrons, antiprotons, muons, taus, charm and strange quarks and, of course, bosons. The building blocks of the building blocks of the building blocks of… well, you get the idea. In early days, this tube was a straight line, and the particles in these linear accelerators would impact against something like a thin foil of metal. But the faster you make particles go, the higher the energy of the collision. And it turns out that, in order to bring particles up to the relativistic velocities required for certain experiments, a tube longer than the circumference of the Earth would be needed. Perhaps a drag race toward the speed of light was the wrong approach, then. Better to build a track around which the particles can travel over and over, with the pedal to the metal the whole time: a ring. But here’s the best part. With a linear accelerator, the best you can hope for is that a particle hits something at some significant fraction of the speed of light, which for objects with mass is impossible to equal or succeed. But by cleverly engineering your ring, you can get particle streams going both clockwise and anti-clockwise. Instead of putting an obstacle in their paths, you just steer them toward each other, like two lanes of traffic going opposite ways around a ring road. Result: A particle going 99 percent of the speed of light going West hits a particle going 99 percent of the speed of light going East — and you get a head-on collision at effectively twice the speed of light. Now there’s something you don’t see often in nature. 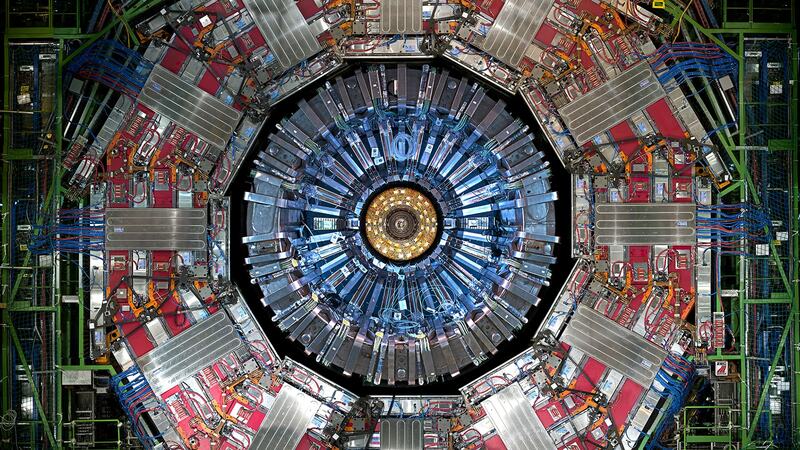 The greatest of these rings is the Large Hadron Collider. Built over three decades, its 27 kilometers span the border of France and Switzerland. The vacuum-filled ring (if something can be said to be filled with nothing) is cooled to 2 degrees above absolute zero. An incongruously small bottle of pure hydrogen feeds protons into the ring, where they are kept in their lanes by thousands of superconducting electromagnets. Each segment of the ring contains a radio-frequency radiation field that oscillates at 400 megahertz, boosting particles as they enter and switching direction to boost the particles going the other way a fraction of a second later. In this way they achieve 99.9999991 percent of the speed of light. Dotted around the ring are the house-sized detectors, vault-like rooms lined with millions of mind-bogglingly sensitive instruments that can detect a single sub-sub-atomic particle. Although there are thousands of bunches of protons, and each bunch may have as many as 100 billion protons in it, and although they are forced into a stream half the width of a human hair, these particles are so incredibly small that the chance of collision is actually quite small — perhaps one collision for every 500 million that miss. But because they’re moving so fast around the ring (they circle it more than 11,000 times per second) and there are so many of them, that still averages out to about a billion particle collisions every second when the beams are aligned. The vast majority of these collisions produce particles that physicists already know about, but every one also has a chance to produce rare particles like the Higgs — which, like many particles, isn’t directly observed but indirectly inferred by the presence of certain other rare particles into which it is theorized to decay. The higher the force with which the protons collide, the more likely it is that they will produce certain high-energy particles. And the larger the ring and stronger the magnets and accelerating radiation, the more force can be imparted on the protons. Which is why the LHC, eventually, may be relegated to being merely one in a stage of accelerators leading to an even larger one — 100 kilometers around. As is often the case in scientific endeavors, the more we learn, the more we realize we don’t know. The search inwards, toward ever more fundamental truths about the way our world fits together, seems to have no end in sight — so Democritus’s theory of the atomos may stand for decades or centuries to come.